The amount of work I had to cram into the 3 days I had meant there wasn't much time to actually be in the place. 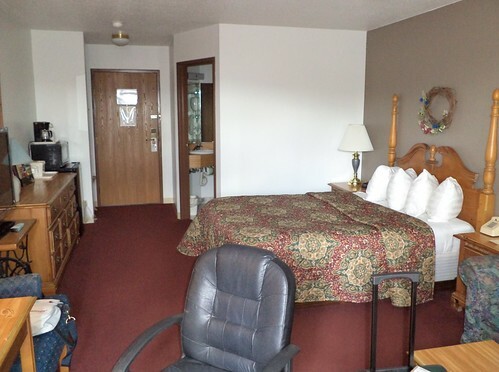 My home was a hotel room that was quite comfortable and, with an exterior entry, very convenient to getting going. Carole will tell you. I always take pictures of the hotel rooms where we stay. It's part of the trip experience and I like to document my trips. I should go through all the travel photos I have and dig out the room photos to see how rooms have changed over the decades of travel I've done. I had 20 minutes on Thursday so I dashed over to the river. This is as close to Iowa as I got. Iowa would be those bluffs in the distance. I had hoped I'd have a chance to visit my dad's grave and to have lunch or dinner with my niece and her family but there just was not time. It was important to me to be down by the Mississippi, even for all of 10 minutes. So, off to St. Feriole Island I went. 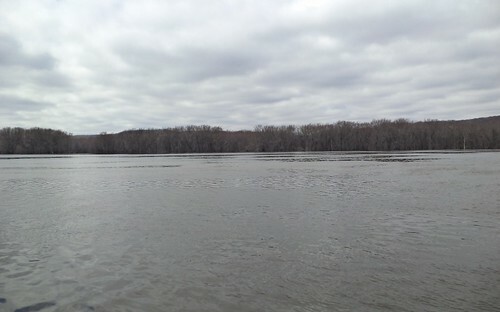 The Mississippi was still high from the snow melt and the huge amounts of rain dumped into the watershed earlier in the month. In years past, both the Delta Queen and the Mississippi Queen riverboats would stop in the summer in Prairie along the waterfront on their way to and from Minneapolis. President Jimmy Carter traveled one of the boats when he was in office, incurring the wrath of passengers by jogging in the early morning hours and waking them up. I remember seeing both of them here. In the summer, this is a wonderful place to be. There are plaques around the park detailing the area. 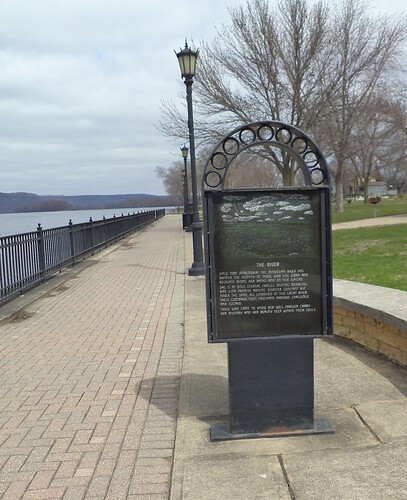 These markers describe the area, the history of the park and the history of Prairie. Since I was last here, a lot of money has been sunk into improvements in the park from the brick walkways to benches to landscaping. 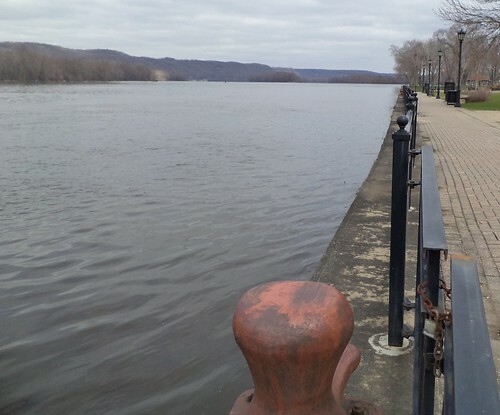 While the history of the area around Prairie goes back to at least 1400 BC with the native American mound builders whose works are preserved at Effigy Mounds National Park, native Americans used the park area for gatherings for thousands of years. This part of the US was mapped by Louis Jolliet and Pere Marquette. One of Prairie's big events held in the park is the Rendezvous, which is a reenactment of an 1840 fur trader's encampment. Head to this link and look up mid-June for details. It's one of those things I should do because it started after I left the area, but when someone says, "I'm going to the Rendezvous", you know exactly where they are going. The biggest attraction on the island is Villa Louis. This Victorian mansion with attendant buildings was build by a successful fur trader, Hercules Dousman. His son built the current mansion and updated the grounds that one tours. 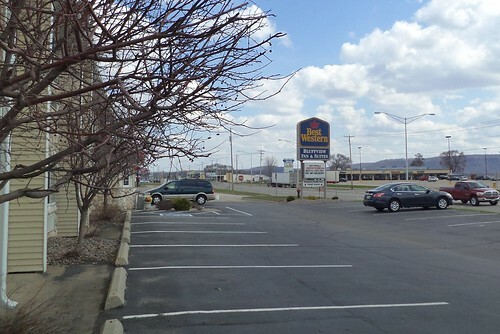 The other big building standing is the former railroad depot, community building and freight house. 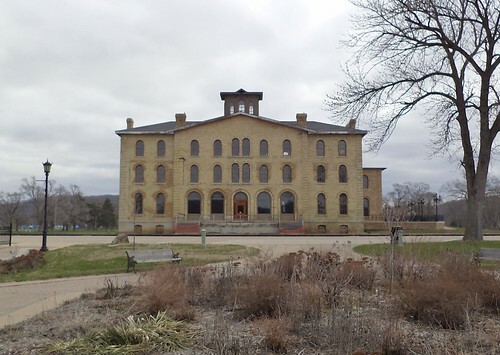 Dousman had a hand in building this, too, feeling that a city the size of Prairie deserved a building as impressive as it. The upper floors are empty. The first floor is used in the summer for events and you can book wedding receptions in the building. When I was growing up, this wasn't as nice as it is now. The railroad occupies the south end of the island. There are still train cars and an engine there now. A great number of people had homes, both summer and all year, on the island and they were in various stages of repair. There were some seedy bars and a place to rent a boat for fishing. Villa Louis was here, as it's been a part of the Wisconsin Historical Society since the 1950's, but driving to it wasn't the nice drive it is now. There also wasn't a lot to park in. You parked along the roads. Friday was a much better day than Thursday but I had no time on Friday to come sit along the river. I was quite nostalgic for dad suddenly saying, "Come kids. We're going to Prairie." We'd pile into the car and drive over here for ice cream and a walk along the river. I would imagine, however, it's still a destination for people in Wisconsin and Iowa. I'll bet you can even get ice cream in the summer.